Art Gallery clothing has become one of the most prominent Modernist related brands of the last few years. They combine great knitwear, shirts and accessories with fine colour pallets and have produced some top shelf clothing over the years. The quality in these garms is second to none and stands the test of time. I've got a few pieces from a few years ago and they're still going strong so that tells you all you need to know. One thing that is apparent about Art Gallery is the fact that like Modernism they are constantly progressing and pushing boundaries with their designs. They move forward like all good Modernists should yet keep producing clothes that make you want to empty all yer wallet come payday. Anyway, our good friend Alex co-founder of AGC sent us two great bits of kit from the current AW17 collection. Let's talk detail, shall we? Made from 100% cotton this piece is proper stunning. Cardigans come and go and most fellas make them look scruffy wearing them alongside un-ironed tee shirts but this is a piece you couldn't possibly wear badly. 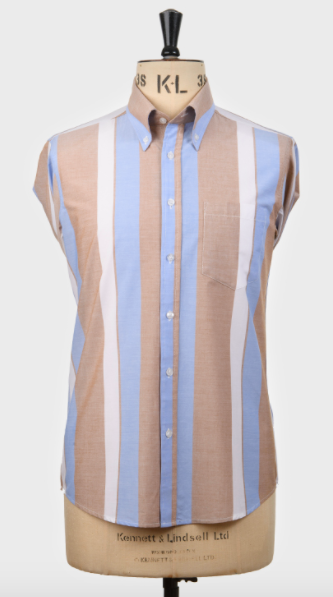 The overall colour is navy blue; however, GUS features tan and biscuit racing stripes on both sides of the placket. Alongside these there is a stripe of cable knit which really adds to the look of this piece giving it that Ivy League vibe. The sleek 6 button placket gives the cardigan a tidy, neat finish. The design is simple, yet effective and I haven't seen anything like this anywhere else which can only be a good thing. It looks great paired with a sky blue Oxford Shirt some slim selvedge denim and a pair of Wolf Suede Clarks Desert Boots. That's the first look that I've worn it with and you definitely turn some heads let me assure you that. Proper piece this for the geezer about town. Mint! What a shirt lads... A proper Oxford with coffee, sky blue and white candy stripe detailing. With that all important 'three finger collar' the 'DAVEY' is a stunning piece of design. The colours compliment one another perfectly and remind me of what Weller's Ben Sherman range shirts would have progressed to if they were given another season. Art Gallery have got really good at the shirt game these last couple of years and the details are all there. Three finger collar with a roll to die for, back box pleat and darts for that all important fitted look, single button cuff with two button sleeve placket its all there ladies and gentlemen. 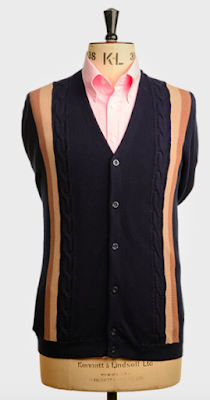 DAVEY looks absolutely ace on and goes really nicely with the GUS cardigan. I'm mega impressed with this piece and have worn it loads already. It comes in a wine colourway too which is equally as nice. It's great to see shirts that are that next level above all the dross you see general lads wearing on the highstreet. I mean I'm all for people wearing what they want but the highstreet just doesn't cut it alongside gear like this. Another proper great bit of kit from the lads over at AGC. Well played boys!